There is just about a month left in the 2019 legislative session, and the majorities in the House and Senate are unveiling their tax and spending proposals as part of the state’s two-year operating and capital budgets. The House Democrats released their proposed operating budget, and even though state government is expected to collect record amounts of tax revenue (thanks to a strong economy), new and higher taxes appear to be a hallmark of their budget. Lawmakers have over $5 billion more for this budget cycle than we did when we adjourned last year. If there was ever a time to raise taxes, it definitely isn’t now. The budget also assumes two other taxes not in the general fund, including increased local property taxes of $1.3 billion and payroll tax for long-term care of over $1 billion. If adopted, this would be the largest percentage increase in state spending in the past 30 years. I’ve warned before that although we have the money now, that doesn’t mean we will have it later. A budget like this puts the state on the hook for all kinds of spending that won’t ever be reversed. It is simply unsustainable. The Senate majority also unveiled their budget proposal. While it doesn’t rely on new taxes, they have still saw fit to introduce legislation that would implement many of the same taxes that are assumed in the House Democrat budget. At a high level, the spending increases are still significant, although a bit lower than the House. The Senate budget increases state spending by almost 17 percent, or $7.5 billion. 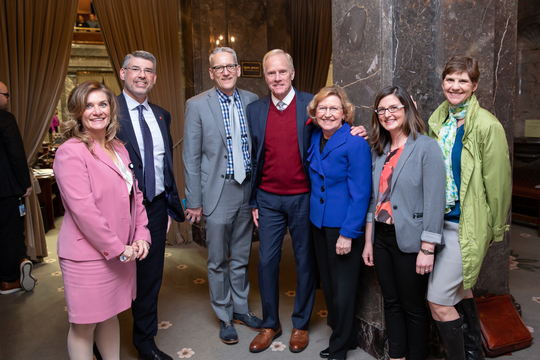 I believe that the Senate majority’s approach is better as it makes needed investments in areas like special education and mental health with the existing money you already send to Olympia. The Senate voted on the operating budget this past Thursday, and now negotiations with the House will begin. I did not vote in favor of the budget at this stage. I offered an amendment to increase investments in areas that I felt were lacking, namely putting resources toward long-term care, but the amendment was rejected. It is critical that we expand access to assisted living, and my proposal would have brought the Senate’s funding level to match the House budget. We need to make this worthwhile investment because some parts of the state have only one assisted living facility that serves Medicaid patients. Without this funding, we’ll likely see facilities close, putting patients into more expensive care settings. We simply can’t afford to lose these vital resources in our community. I’ll be sure to keep you updated as negotiations progress. You can see more detailed information about each budget proposal by clicking here. The Senate rolled out its proposed capital budget, which funds many community and state infrastructure projects throughout the state. This budget is usually a bipartisan product and includes a lot of great investments. The budget proposed this week totals just over $5 billion and will put resources towards things like building more mental-health treatment capacity, investing in colleges and universities, and supporting water projects. Below are some high-level figures suggesting where your dollars will be invested. This doesn’t include traditional local projects that I’ve fought for, as I won’t put out that list until there has been agreement between the House and Senate versions. But rest assured, my House seatmates and I are working closely on these to make sure the 10th District’s needs are met. Click here for more information on the Senate’s capital-budget proposal. In addition to my work on the budget, I have also been fighting a growing public-health problem: youth smoking. I co-sponsored legislation in the Senate to raise the minimum age for purchasing tobacco products to 21; the House version of that change was approved in the Senate and was signed by governor. This is a major public-health victory, as it will limit a young person’s ability to purchase a highly addictive product with long-term personal and societal costs. This ban on sales also includes “vapor” products which are a growing problem in our schools. While the bill is not as comprehensive as I would have liked, it is a step in the right direction. Unfortunately, the legislation still permits those under 21 to purchase tobacco products at tribal establishments and doesn’t include any prohibition for underage people to possess tobacco products. Please don’t hesitate to reach out to my office with any questions or concerns. I’m here to represent you.